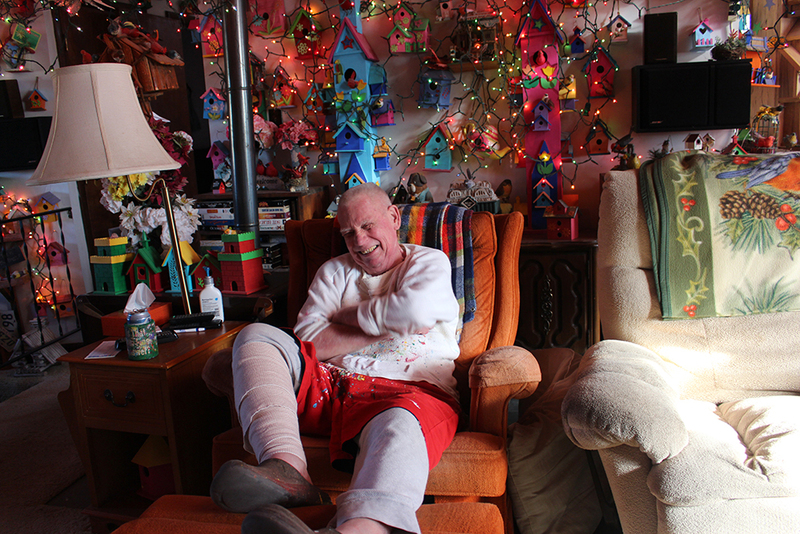 Known as “Crazy Bill,” he makes life a little more colorful for local fauna. Nearly 3,900 hand-made birdhouses line Bill Larkin’s yard, with another 2,000 on the walls, cabinets and floors of his house. Larkin, a retired former computer engineer, used to plant flowers to add color to his yard, but after the summer of 2011, he stopped planting and started painting. The best part? He gives a free birdhouse to every visitor who asks. Here, he shares some of what he’s learned over the years about crafting avian domiciles and trying new things. At the start, I really didn’t know how to build a birdhouse. I just looked at one I had bought and tried to measure it and build it kind of like they did. At first, the darn things just would not go together right. I was not drawing the line the best in the world, and when I sawed it, I wasn’t getting on the line. Start with the right materials, like outdoor paints for outdoor projects. I started with non-gloss paint, which basically is just an indoor paint. I bought two colors in the gloss just because they didn’t have it in the indoor paint. And I thought, Those look prettier a year later, and the bird house isn’t rotting. Michaels craft store has the best pre-made birdhouses and a senior discount. You have to ask for the senior citizens’ discount there. They don’t just give it to you. You ask and, by gosh, yeah, no problem. Birds don’t take much work. I was feeding birds most of those years I had flowers. In the wintertime, not in the summertime. And that got to be very expensive, like, way over a thousand dollars a year. And it was such a mess that I finally gave it up. There are so many different kinds of worms in this yard, because there’s a lot of moss and stuff in different places, that the birds can find stuff to eat even in the wintertime here. I don’t have a computer or a smart phone. That’s what I did for 36 years at Crane, and I’m just not interested in typing anymore. So many people retire, and they want to do the same thing after they retire, and I think that is so silly. Try to do something different.